Update: Alan Partridge Online – Mid Morning Matters Episode 6 is released below. Alan Partridge is back on our screens, well actually he is back online. Steve Coogan is bringing back his most famed character in a joint promotion with Fosters. Foster’s Funny aims to bring back classic comedy of yesteryear and is starting with the non perishable pants man that is Alan Partridge. 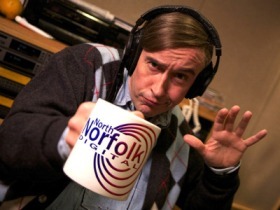 No longer on Radio Norwich, Alan Partridge is now working on North Norfolk Digital (we didn’t even realise North Norfolk had broadband…) with his new show mid morning matters.